First floor has a large, sunny, open dining/kitchen area. Glass doors open onto a large back deck and secluded back yard with BBQ and outdoor shower. First floor also includes 1 bedroom with a queen and a twin bed, 1 bedroom with a queen bed, a full tiled bath and a living room with fireplace. Staircase off of the living room leads upstairs to a bathroom with shower, a big, sunny, open bedroom with a queen and a twin bed, and a separate sleeping area with a double bed. Wood floors throughout. Wireless internet included. Close to ponds, ocean (National Seashore- Newcomb Hollow, Cahoon's Hollow), town, harbor. Additional availability info: Off-season rental days/price negotiable, early/late season start dates negotiable. This is a Saturday to Saturday vacation rental. Additional pricing info: Off-season rental days/price negotiable, State and local taxes of 12.45% will apply. We were lucky enough to rent this charming Cape Cod home for our recent family vacation. Jessica, the owner, is on top of her game; quickly responds to any questions, has a WELL stocked home with everything you will need, and she is delightful to work with!! We arrived and her husband dropped down about an hour in to bring us a bottle of wine, and to be sure we found everything. The kitchen is one of the best outfitted I have ever been to; I always bring one "good" knife with me, because most rentals have poor quality equipment-they have 4-6 really good knives, as well as a number of higher end accessories. The bedrooms are spacious, especially the very large master upstairs, and all include extra pillows and blankets, as well as fans. There is a 4th sleeping space upstairs as well. Both bathrooms are clean and large, and the outdoor shower is delightful. I was a big fan of the kitchen-the owner has a couch in sitting area that is AWESOME-you are comfy but on the spot with all the kitchen and living room activities. The pictures don't do the charm justice, especially of the deck area-we spent a lot of time outside, having a fire pit, or eating around the big table, or just enjoying the scenery. They have a washer-dryer for your use and many beach chairs-don't haul them along! We are hoping to return to the place for our next Cape adventure. Very quiet, restful, and only 2 miles from a calm and easy to reach ocean beach and a even more calm and quiet pond area. This property was perfect for the 6 adults we brought-everyone had "space" and we could also gather easily. Highly recommend! We had a wonderful time at Jessica's home. The weather was just perfect. We were in a very quiet area this year and just loved the area especially with the ocean side of the Cape being so close to the house. Jessica's home accommodated all 8 of us just fine, very spacious and relaxing. We just loved it!!! We would love to return next year!!!! We rented this ocean side home for 2 weeks in July, 2017, with our grown sons and daughters in laws and a 1 year old grandson. The house was perfectly comfortable for all of us. Kitchen incredibly equipped, bathrooms so clean and outdoor shower was a perfect after beach addition! We were able to drop off at Newcomb and return home because it was so close to the ocean beach and Gull Pond to make all family members happy! This is a perfect beach home for a large family. It comfortably accommodated 4 adults and 4 children; there was lots of community space and enough seats to come together and private space to retreat to as well. The deck is a wonderful addition of outdoor living space, and we enjoyed eating outside on the days when the weather cooperated. The decor was charming and comfortable, the kitchen was adequately equipped, and the flower garden and container gardens were beautiful. 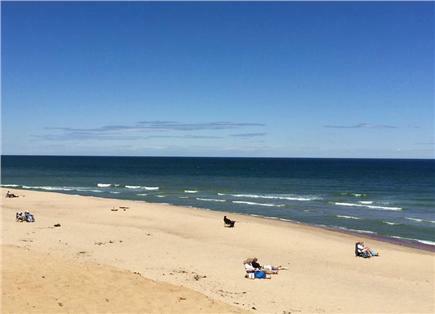 The location of the home is very convenient; it is within easy driving distance of the Wellfleet community beaches, two National Seashore beaches (we went to Head of the Meadow for 3 days because we liked seeing the seals) and walking distance to Wellfleet Town Center. Thank you, Jessica and Nat! We had a great time at your lovely, quintessentially-Cape-Cod house with our kids and grandkids this week! Plenty of room for six adults and two kids, sunny and bright, lots of windows for fresh air, well-appointed kitchen, comfortable beds, lots of games and toys, spacious deck, beautiful flower garden. Thank you so much! Hi Jessica, We had a wonderful family experience in your cozy home.....even in the rain. We did a lot of cooking! Everything was just right and I can't think of any changes. Thanks for mentioning the 'PB Boulangerie' ooohh lala, what great goodies and bread. It was worth waiting in line. Fondly, M.